The ITCA 650, a small titanium osmotic mini-pump, provides a subcutaneous infusion of exenatide over 3 or 6 months. 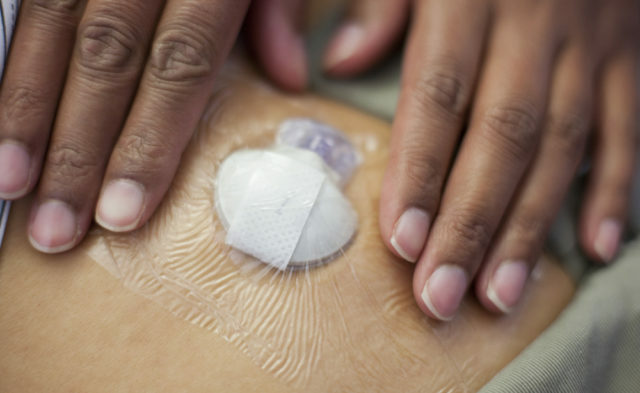 ORLANDO — ITCA 650, an osmotic mini-pump inserted subdermally in the abdominal wall, has been shown to be both safe and effective in reducing both glycated hemoglobin (HbA1c) and weight in individuals with type 2 diabetes. This research was recently presented at the American Diabetes Association’s 78th Scientific Sessions held in Orlando, Florida, June 22 – 26, 2018. This pooled analysis included data from 2 randomized, double-blind phase 3 studies investigating safety and efficacy of ITCA 650 20/60 µg/day compared with placebo or sitagliptin 100 mg/day. There were 418 participants in the ITCA 650 group, 265 in the sitagliptin group, and 154 in the placebo group. ITCA 650 was associated with greater improvements in mean reduction in HbA1c (-1.4±0.06% vs -0.9±0.07% in sitagliptin and 0.05±0.15% in placebo) and body weight (-3.5±0.25 vs -1.1±0.28 in sitagliptin and -1.6±0.50in placebo) at week 39. Treatment-emergent adverse events were more common with ITCA 650 than with sitagliptin or placebo, but this association was largely due to increased occurrence of gastrointestinal treatment-emergent adverse events. ITCA 650 features a subcutaneous, steady release of exenatide for a 3- or 6-month course. The participants in this study were previously on other antidiabetic drugs but failed treatment. The primary end points included the mean change at week 39 of weight, HbA1c levels, percentage of patients reaching HbA1c levels of less than 7%, and combined weight reduction and HbA1c levels. This study was supported by Intarcia Therapeutics, Inc.
Kjems LL, Prabhakar P, Schwartz B, Huang H, Baron MA. Efficacy and safety of ITCA 650, an injection-free GLP-1RA, in T2D patients—A pooled analysis of phase 3 studies. Poster presentation at: ADA 2018 78th Scientific Sessions; June 22-26, 2018; Orlando, FL. Poster 1103.